In 1966 the Baltimore Orioles finally shook off their St. Louis Browns roots by winning the franchise’s first World Series, defeating the mighty Los Angeles Dodgers in four straight games. 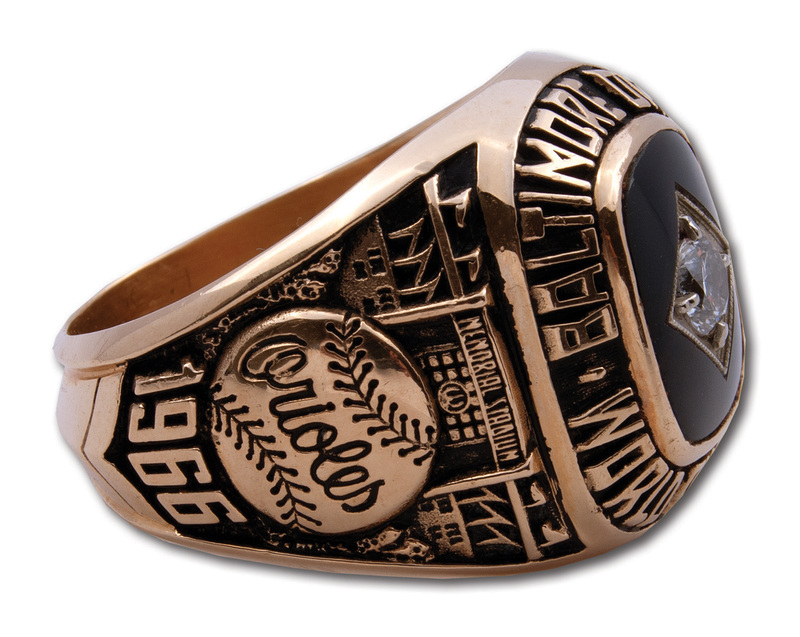 The ’66 O’s were headed by newcomer Frank Robinson, who celebrated his switch to the American League by winning the Triple Crown, and a solid pitching staff consisting of Jim Palmer, Dave McNally and Steve Barber. Holding down the corner infield sports were the slugging Boog Powell and Hall of Famer Brooks Robinson, while the outfield boasted Robinson, Paul Blair and Curt Blefary, the previous season’s A.L. Rookie of the Year. Blefary finished the ‘66 campaign by hitting the third most homers on the team (23) and establishing himself as a favorite with the Baltimore fans. Even after a career that saw him also play for the Astros, A’s, Yankees and Padres, Blefary remained fiercely proud of his Baltimore days to the point of his wish to have his ashes scattered in the old Memorial Stadium upon his death in 2001. 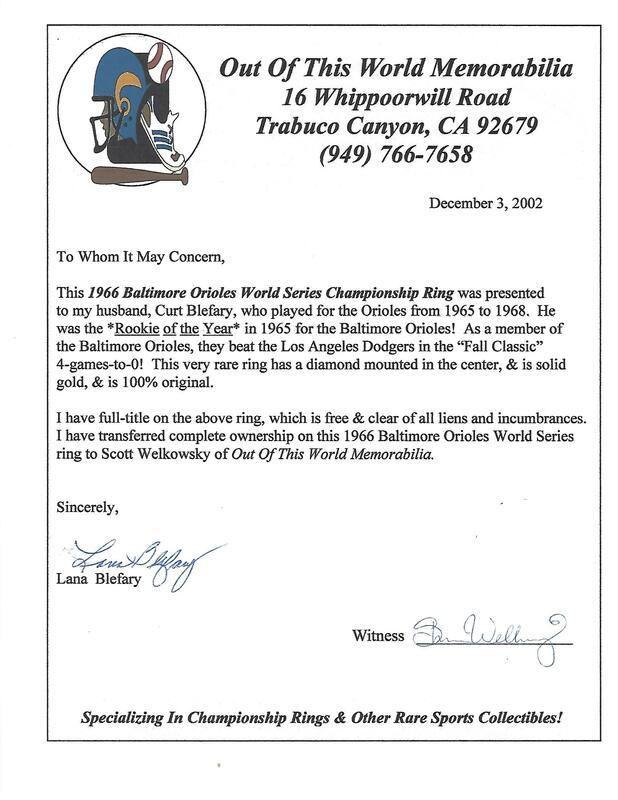 This World Series ring was awarded to Blefary for his part in Baltimore’s first World Championship. The 14K gold ring has a single diamond mounted on black onyx on the top, surrounded by “BALTIMORE ORIOLES WORLD CHAMPIONS” in raised lettering in the same Art Moderne style found on the facade of Memorial Stadium. 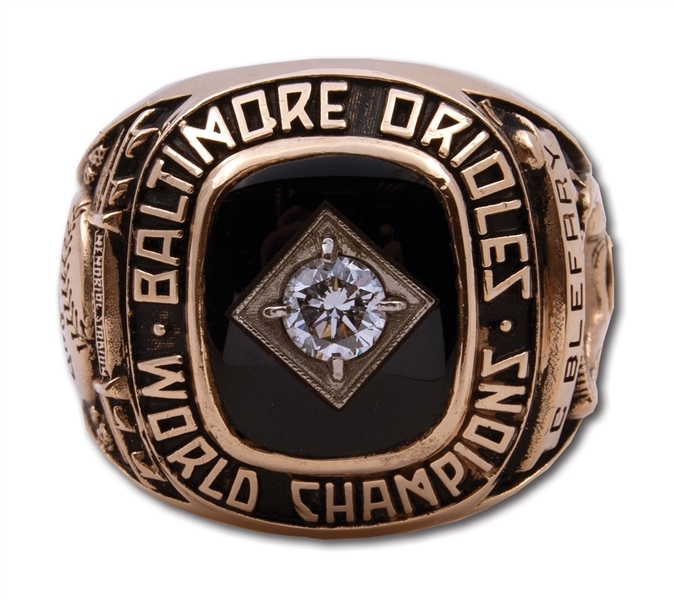 The left shank has a ball with “Orioles” in front of the exterior of memorial Stadium and the year “1966” in raised letters below. 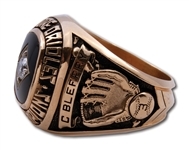 The right shank has a ribbon with “C BLEFARY” above a mitt and ball with his number “3” engraved. 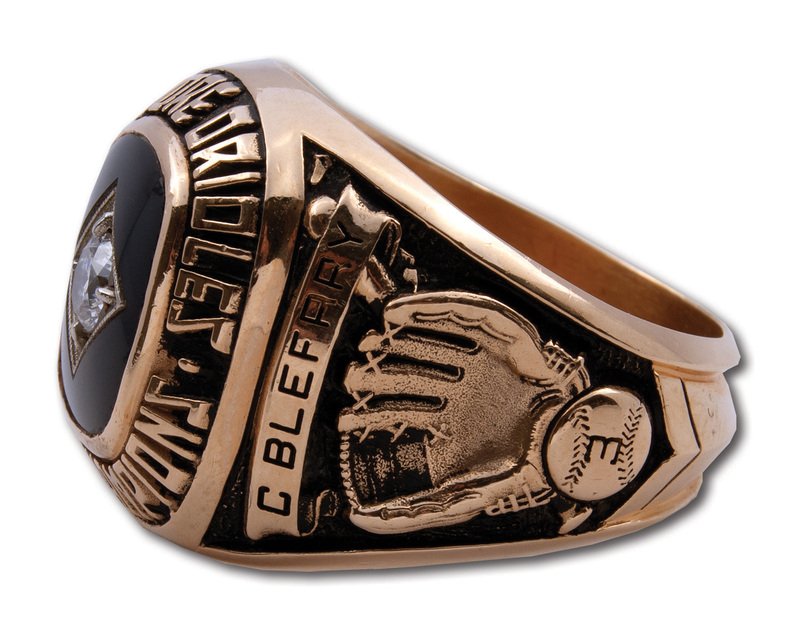 The interior of the ring is engraved with “Curt Blefary” along with “BAL 14K” hallmark. 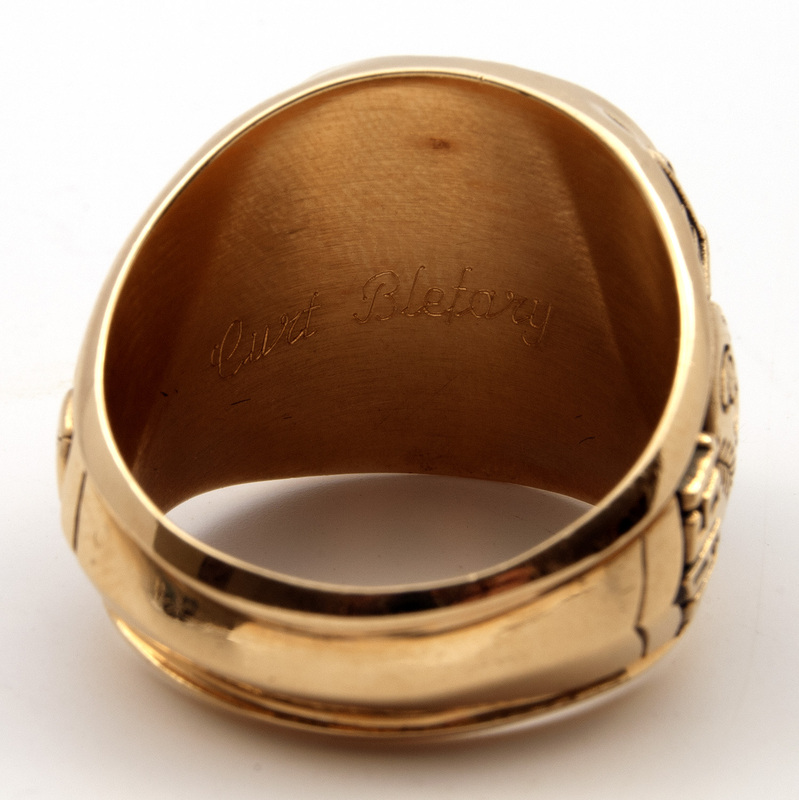 The size 12.5 ring weighs 34 grams and comes in fantastic condition with little surface wear. Includes LOA from Blefary’s widow.